Member proceeds to an IWC Accredited Hospital for an admission order and presents his/her IWC Card. For Hospital w/ Medisystem: staff will generate IWC Letter of Eligibility through Medisystem. For Hospitals w/o Medisystem: staff will call IWC Call Center hotlines to secure Letter of Eligibility. 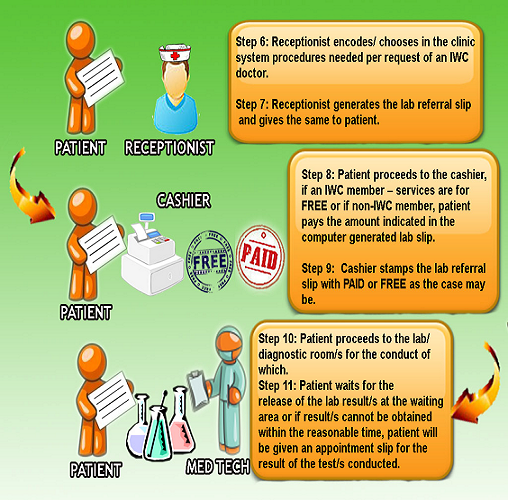 For hospitals w/ Medisystem: Hospital staff will generate a Letter of Guarantee through Medisystem upon discharge. For hospitals w/o Medisystem, staff will call IWC Call Center to secure Letter of Guarantee. Member will pay charges in excess of the amount of coverage, if there is any. 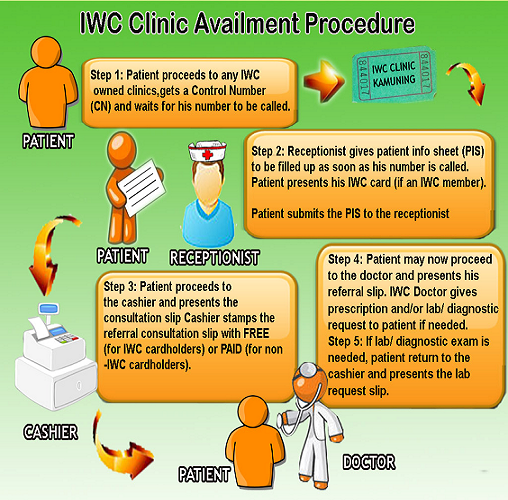 IWC Member proceeds to any IWC accredited clinics for Out-Patient availment. Member presents IWC card to clinic staff. Member may proceed now to an IWC doctor.